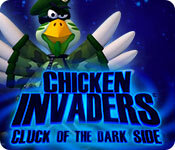 Chicken Invaders 5: Cluck of the Dark Side is rated 4.9 out of 5 by 20. Rated 5 out of 5 by Bakwudz from Death to All Chickens! 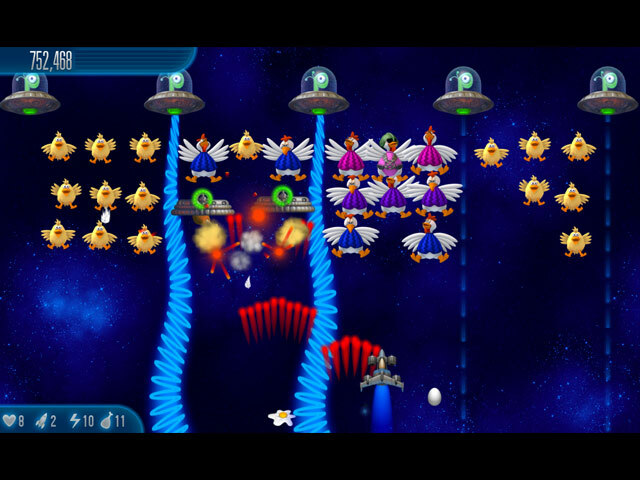 These Chicken Invaders games are just great, and this is no exception. It is fast, fun, fair, and funny. You just can't ask more from a game than that! Rated 5 out of 5 by SubaruFrog from AWESOME!!!! Another amazing game in the series! The story is great, game play is very challenging and graphics are superb! There's some new features too. An excellent game to pass the time. Very entertaining! :-) My only gripe is it sometimes hiccups on my laptop. Rated 5 out of 5 by deputygirl64 from Playing Chicken is Such FUN! Excellently silly game! Addictingly fun! Graphics are great, game play is great! Down right funny and fun! Love it! Rated 5 out of 5 by sabinesa from What great fun!! Wow, just when I was moping about because I had no fun game to play right then, up came the new installment of Chicken Invaders. These guys are really outdoing themselves and it's such a good example of how to do sequels without killing what made the franchise so great in the first place. All the game mechanics are as they were and the overall approach and premise is identical. Some might think so now it would get boring, but it just doesn't. Firstly there are new scenes so to speak, for example underwater, which is really wonderfully executed, down into a crater and on an icy planet with related wind, storms and all. Also, there's a lot of play from the side or top instead of the repetitive from the bottom, which makes for a super non-boring flow with new excitement around each corner. Then there are new unlockables, like score handicaps and certain deals for more points, say only have one life to start with for an added 10% score bonus, or get 20% more keys. Also some new guns have been added when I thought they must have exhausted what's possible for a shooter and here they come with something throwing chicken nuggets and another gun that sort of spreads laser beams - real fun to explore, try out, experiment with and get annoyed with if one accidentally exchanged one's forks for nuggets ;) I don't know how often I have already played (and finished) this and I don't think I am even close to having exhausted my ability to come up with new goals for myself, trying out the handicaps, different backgrounds, etc. In general I don't enjoy shooters at all, besides not being good at them, but this is just such outrageous fun that I feel sorry for anybody that doesn't at least try it out, as they might be missing real cool excitement. Please, can we have greatness like this more regular! Rated 5 out of 5 by bradleymatthews from Chickens Invade My Day This game is awesome. I don't consider myself much of a gamer, and it takes something pretty radical to interest me enough to want to sit and play. Chicken Invaders has me hooked! Or pecked? 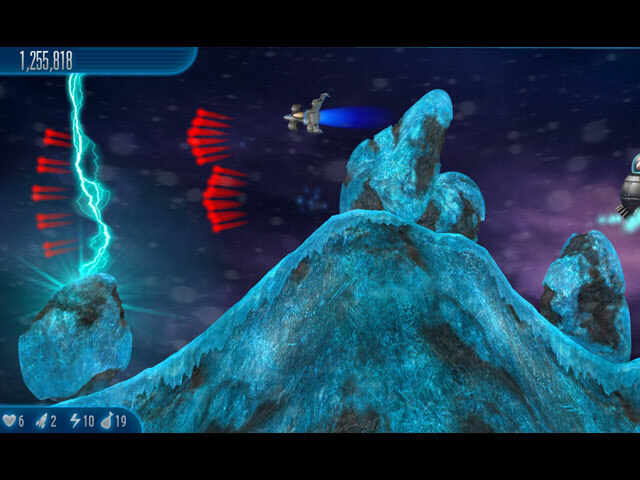 If you're looking for a fun shoot em up, get this one. Rated 5 out of 5 by clickme2 from Best Chicken Game Yet! This one really is worth buying, I only played it for 15 minutes before buying. The graphics are fantastic, some new weapons with the old, you can customize your ship with different colours. It is harder than the other chicken invaders but that makes it more of a challenge. It really is the best chicken invaders game so far, very different to all the others. Give it a go, you won't be disappointed, especially if you have played the previous chicken games! Rated 5 out of 5 by lancsroyal from Chicken Invaders-I'll spare you the egg puns! I purchased this without hesitation as I have loved all the previous games in the series. I wondered how the developers would manage to keep the game fresh but they have done it. Shooting from the right to the left or while spinning made a change from shooting from the bottom up. 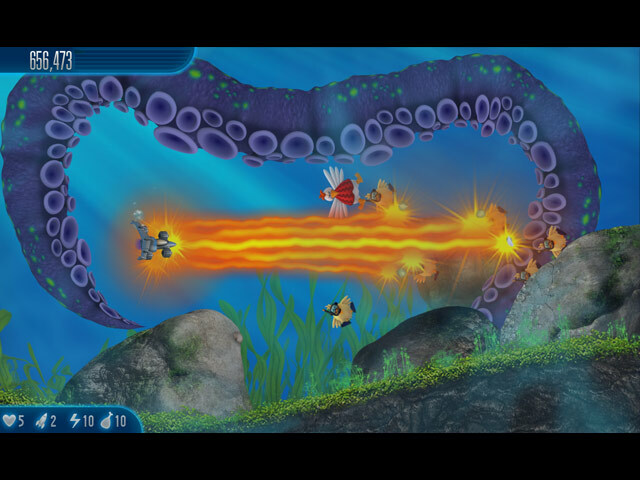 The undersea planet is particularly clever and I had a good laugh when the chickens with snorkels first appeared. I also like the added features like being able to choose the colour of your ship and the chart which shows your achievements to date. The storyline is as witty and clever as ever. I look forward to many happy hours playing. It makes a nice change from the hidden object games I normally play.